Hamaree rasoi: Kalakand Recipe -Sweet for Holi !! Firstly I would like to wish all my readers and blogger friends from all across the world a Happy, vibrant and colorful Holi. In order to celebrate this festival of colors, I would like to present a very popular North Indian sweet called Kalakand which is loved by everyone for its soft and melt in mouth texture. For those who have not tasted this sweet , the key ingredient of this sweet is milk and sugar, but here I have posted milkmade version as I find it quick and have to spend less time in the kitchen. So, once you have started playing Holi keep on popping in few pieces of kalakand in between to energize yourself and apply colors to each and every near and dear ones. Play a safe Holi with Eco-friendly colours !!! Boil milk in a heavy pan and stir continuously on medium flame till it is half. Add a pinch of phitkiri and sour curd. This will help in crystallization, keep stirring till the extra water dries up. Add milkmaid, sugar and keep stirring the mixture till the mixtures becomes semi dry and leaves the edges of pan. Add cardamom powder and mix well. Turn off the heat and immediately spread the mixture in a greased tray. Sprinkle nuts on top and with the back of flat spatula slightly press it against the kalakand. Let it cool, then cut into squares. To set these properly you can store the pieces in an air tight box and keep inside the fridge for later use. I love them a lot dear. Nice and colourful presentation. BTW where did u get tulpis from?? @Zareena: these are artificial flowers, bought from kolkata. looks to good n delicious .. Happy Holi! Kalakand is so delectable, rich n yummy at the same time. Lovely pics deepa. kalakhand looks so delicious.. Havent really tried making it though.. Your post has tempted me to give it a try.. Happy holi!! I love kalakand and these clicks are so good. Love this. I had made this long ago before marriage and my mom had appreciated it. Very very rare when she praised my cooking. Thanks. What a lovely way to celebrate Holi,yummilcious.. 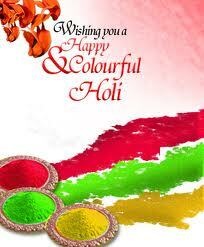 Happy Holi to u n your family,Deepa!! Happy Holi! Very Delicious treat...nice clicks!! Happy Holi! lovely post and presentation. I tried this sweet too, but slightly with different ingredients. Your look amazing! wow! !yummy sweet! !ganesh looks very cute...beautiful click! oh my! its my favourite! But ive never tried making it at home! thanks for the recipe! btw, what is Alum? and where do we get it? Hope you had a lovely Holi. Kalakand looks absolutely mouth watering. Happy Holi Deepa...love kalakand...looks absolutely yummy...tmepting. Happy Holi , Delicious kalakand. Kalakand looks very perfect and super delicious. Hi...Delicious recipe of kalakand and such a cute ganeshji. where did you get it? Delicious...Love this sweet very much. Happy Holi and this luks droolworthy. So yumm! happy holi dear..looks really yummy dear..
Hmmm that recipe looks so tempting! Happy holi to you. My best holi wishes to everyone!